You’ll be relieved to know that Excel 2013 has a built-in spell checker that can catch and remove all those embarrassing little spelling errors. With this in mind, you no longer have any excuse for putting out worksheets with typos in the titles or headings. Any way you do it, Excel begins checking the spelling of all text entries in the worksheet. 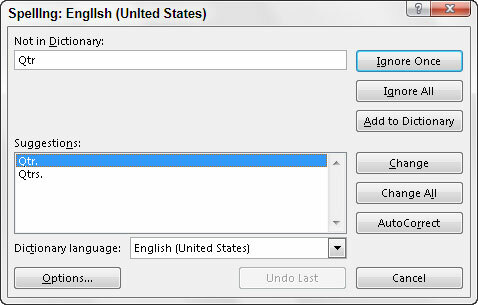 When the program comes across an unknown word, it displays the Spelling dialog box. Ignore Once and Ignore All: When Excel’s spell check comes across a word its dictionary finds suspicious but you know is viable, click the Ignore Once button. If you don’t want the spell checker to bother querying you about this word again, click the Ignore All button. Add to Dictionary: Click this button to add the unknown (to Excel) word — such as your name — to a custom dictionary so that Excel won’t flag it again when you check the spelling in the worksheet later on. Change: Click this button to replace the word listed in the Not in Dictionary text box with the word Excel offers in the Suggestions list box. Change All: Click this button to change all occurrences of this misspelled word in the worksheet to the word Excel displays in the Suggestions list box. AutoCorrect: Click this button to have Excel automatically correct this spelling error with the suggestion displayed in the Suggestions list box (by adding the misspelling and suggestion to the AutoCorrect dialog box). Dictionary Language: To switch to another dictionary (such as a United Kingdom English dictionary, or a French dictionary when checking French terms in a multilingual worksheet), click this drop-down button and then select the name of the desired language in the list. Options button to open the Proofing tab in the Excel Options dialog box where you can modify the current Excel spell-check settings such as Ignore Words in Uppercase, Ignore Words with Numbers, and the like. Notice that the Excel spell checker not only flags words not found in its built-in or custom dictionary, but also flags occurrences of double words in a cell entry (such as total total) and words with unusual capitalization (such as NEw York instead of New York). By default, the spell checker ignores all words with numbers and all Internet addresses. If you want it to ignore all words in uppercase letters as well, click the Options button at the bottom of the Spelling dialog box, and then select the Ignore Words in UPPERCASE check box before clicking OK.
You can check the spelling of just a particular group of entries by selecting the cells before you click the Spelling command button on the Review tab of the Ribbon or press F7. Excel also has a Thesaurus pane that enables you to find synonyms for the label entered into the cell that’s current when you open the pane (or that you type into its text box). To open the Thesaurus pane, select Review→Thesaurus in the Proofing group at the beginning of the Review tab on the Ribbon or press Shift+F7. Excel then opens a pane showing a list of all the synonyms for the label in the current cell or the term manually entered in its text box. To view more synonyms for a particular term in the list, select it. To replace the label entered in the current cell with a term in the Thesaurus list, select Insert on the term’s drop-down menu.